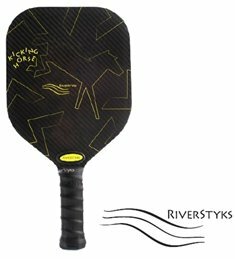 The Kicking Horse pickleball paddle is our paddle-not to be confused with our RiverStyks Rubicon or Fox pickleball blads-that will last longer than current paddles at this price point. Especially relevant is our 1 year warranty. Meets USAPA paddle requirements and comply with all Rules & Requirements of USAPA , with test results shown on USAPA website Paddle Test Results online listing. If you have any questions about this product by RiverStyks, contact us by completing and submitting the form below. If you are looking for a specif part number, please include it with your message.